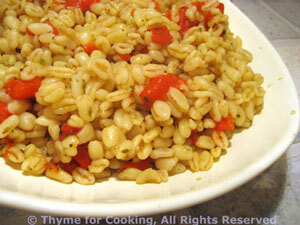 Barley with Red Pepper, colorful gourmet sides from Thyme for Cooking. A bit of red pepper adds not only some bright color but some bright flavor to almost any food. I use quick-cooking barley, which takes about 15 minutes. Cook in chicken stock for added flavor. Simmer until done, stirring occasionally. If all stock is not absorbed, drain. Stir in pepper, vinegar and serve.